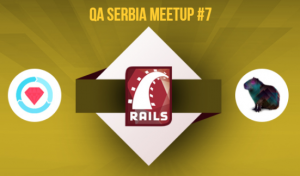 We are organizing the QA Serbia meetup No.7. on Thursday, Jun 28th at 6 pm in StartIt Centar. Our friend Vlada will talk about Ruby & Rails approach of testing, RSpec, Capybara as a different approach of UI testing and of course best practices. 19:30 – 20:00 Ask what you want? The meetup will be held on the 28th of Jun starting at 18:00 hours at Startit Center Belgrade (Savska 5). Meetup attendance is free but we require all potential visitors to RSVP at the following page.